"Is that so? I'd always thought that human beings invented numbers." "No, not at all. If that were the case, they wouldn't be so difficult to understand and there'd be no need for mathematicians. No one actually witnessed the first numbers come into being -- when we first became aware of them, they'd already been around for a long time." 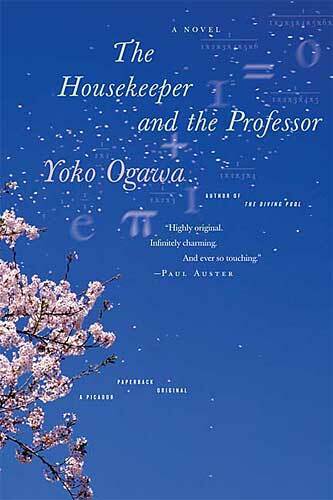 The Housekeeper and the Professor is a quiet, gentle story which somehow manages to encompass a great deal without very much happening. It is told in a humble, somewhat detached way by our unnamed narrator, a young, veteran housekeeper who is hired to take care of the Professor. A brilliant mathematician, he lives alone in a small shack on the estate of his well-off, widowed sister-in-law. In 1975 he was in a terrible accident that left his brain unable to make new memories; after 1975, his memory lasts only eighty minutes. There have been many other housekeepers before our narrator, but somehow our narrator and the Professor click. What could have been a difficult assignment turns into a wonderful, if unusual, friendship. This can't have been an easy book to write, but what a gift it is to the rest of us to be able to read it. I think the narrator could have been telling us about toe jam and I would have read it and happily. Instead, she's telling us about math, memory, friendship, and baseball, reminiscing and thoughtful. The language is evocative and beautiful; there are no moments where I was brought out of the text by a clumsily translated line, though every once in a while I was caught by the poetry of it. If you added 1 to e elevated to the power of π times i, you got 0: eπi + 1 = 0. I looked at the Professor's note again. A number that cycled on forever and another vague figure that never revealed its true nature now traced a short and elegant trajectory to a single point. Though there was no circle in evidence, π had descended from somewhere to join hands with e. There they rested slumped against each other, and it only remained for a human being to add 1, and the world suddenly changed. Everything resolved into nothing, zero. It was the narrator herself that held me firmly to the story. She is quiet, unassuming, and always distanced, but reading between the lines one gets a picture of her: patient, hard-working, very bright, stubborn and strong, and incredibly kind. She hasn't had an easy life, though we don't get too many details as the story isn't supposed to be about her. She tells it mostly chronologically, though every once in a while there is a small jump forward or backward; it's never hard to figure out where we are in the narrative. Her sense of wonder at the world the Professor opens up to her is palpable if understated. When we are introduced to her son, nicknamed Root, we recognize her deep love for him, as well as her desire for him to have everything she can offer, and more. The book is evocative, whether of its characters, mathematics, baseball, or the setting. A heat wave, a storm, a garden, an evening ball game, a busy street -- after reading these words about them, the real world is set at a different, more quiet, contemplative angle. What is most interesting to me is that this is an easy book to read. It manages to be a lovely story on the surface, while having difficult themes, being beautifully written, and about topics I would normally avoid, without being a painful or dense read. I'm still not a baseball fan, but I can appreciate a different side of the game now; I will never be deeply enamoured of mathematics, but I can certainly understand how one might become so. Reading this book was a treat, and I'd encourage everyone to pick it up, even if it doesn't seem like it might be your thing. It's not full of action, excitement, or romance, but if you're looking for something a little quieter, a little more meditative, something that reads smoothly and rewards attention even if it doesn't require it, you cannot go wrong here. I've never heard of this, but you've written such a nice review that I'd really like to read it now. Thanks. Nan, I think you'd like it. It's a calming read, too -- even days after I've finished it I find thinking about it calms me.